↑"Proposed Flight Deck Cruiser." 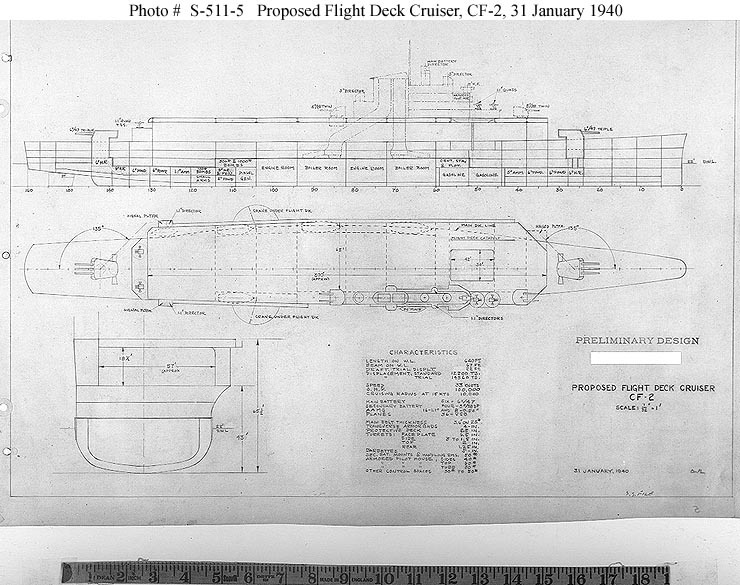 Preliminary design plan prepared for the General Board during the final effort to develop a flight deck cruiser ("CF"). 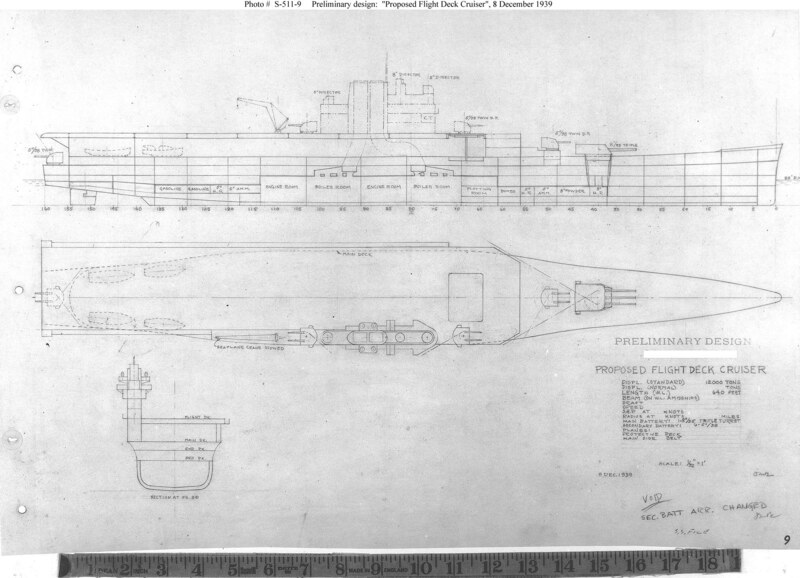 This plan, dated 8 December 1939, is for a 12,000 ton standard displacement ship with a main battery of three 8"/55 guns and a secondary battery of eight 5"/38 guns (six specified in table). Ship's waterline length is 640'. The data table leaves other characteristics blank, and the plan is annotated "Void - sec. batt arr. changed". Scale of the original drawings is 1/32" = 1'. The original plan is in the 1939-1944 "Spring Styles Book" held by the Naval Historical Center. U.S. Naval Historical Center Photograph. ↑"Proposed Flight Deck Cruiser." 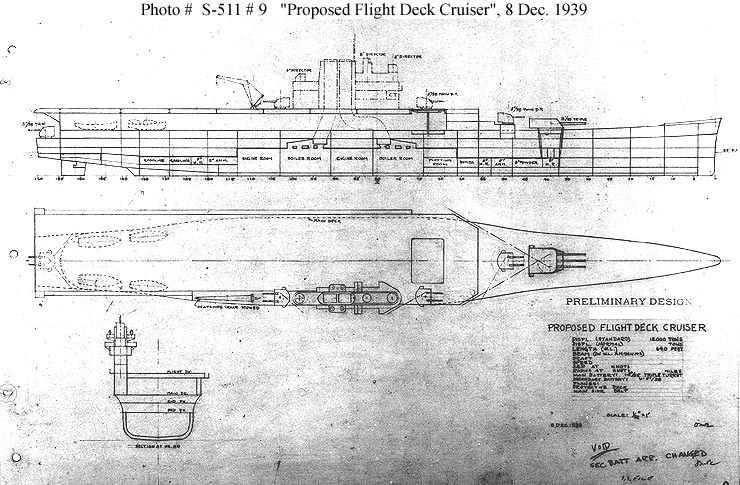 Preliminary design plan prepared for the General Board during the final effort to develop a flight deck cruiser ("CF"). 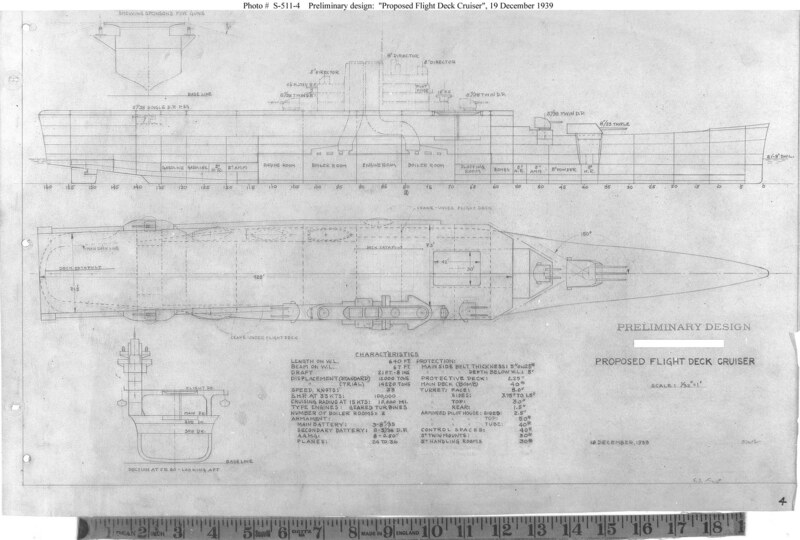 This plan, dated 19 December 1939, is for a 12,000 ton standard displacement ship (14,220 ton trial displacement) with a main battery of three 8"/55 guns, a secondary battery of eight 5"/38 guns and an aircraft complement of 24 to 36. 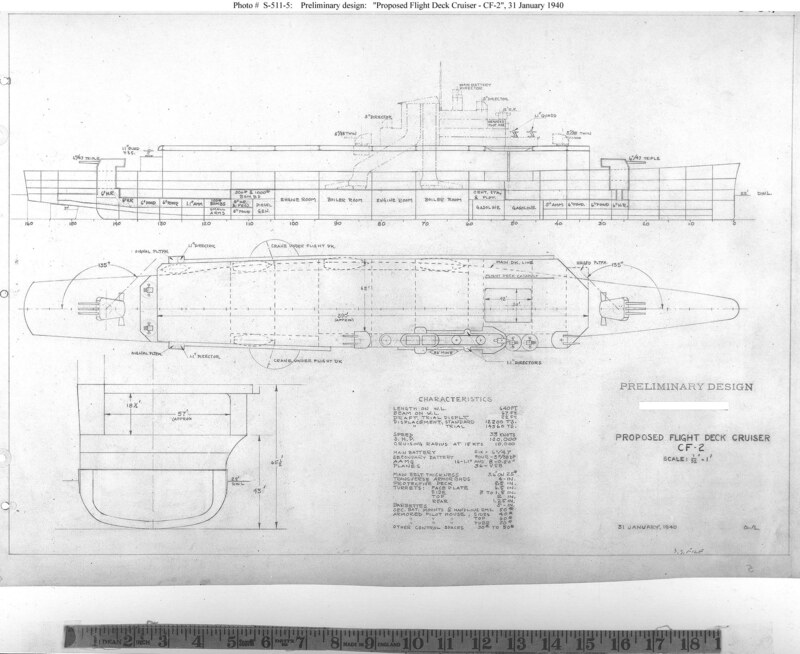 Ship's dimensions are: waterline length 640'; waterline beam 67'; draft 21' 8". Powerplant has 100,000 horsepower for a speed of 33 knots. Scale of the original drawings is 1/32" = 1'. The original plan is in the 1939-1944 "Spring Styles Book" held by the Naval Historical Center. U.S. Naval Historical Center Photograph. ↑"Proposed Flight Deck Cruiser, CF-2." 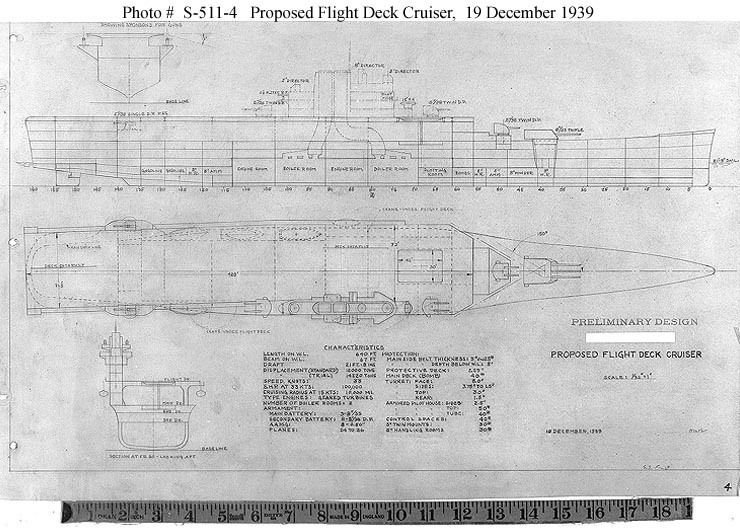 Preliminary design plan prepared for the General Board during the final effort to develop a flight deck cruiser ("CF"). This plan, dated 31 January 1940, is for a 12,200 ton standard displacement ship (14,560 ton trial displacement) with a main battery of six 6"/47 guns, a secondary battery of four 5"/38 guns and an aircraft complement of 36 scout-bombers. Ship's dimensions are: waterline length 640'; waterline beam 67'; draft 22'. Powerplant has 100,000 horsepower for a speed of 33 knots. Scale of the plan and side elevation drawings is 1/32" = 1'. The original plan is in the 1939-1944 "Spring Styles Book" held by the Naval Historical Center. U.S. Naval Historical Center Photograph.